Most of the people don't believe that a small Nepalese company can also have a second home in Finland. But Finland is no different. Finland loves Nepal and Nepalese people very much. Well, our founder has lived most of his life in Finland and considers Finland as a second home so basically our company, Unelma Platforms has found it's second home in Espoo, Finland. 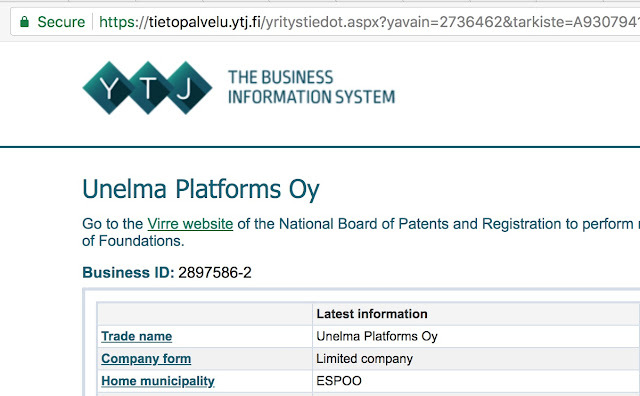 We are called Unelma Platforms Oy (which is equivalent to saying Unelma Platforms Pvt. Ltd.). A limited liability company so to say. You can see our business ID now publicly and get to know more about us. Of course, most of the company information is not disclosed publicly because of security and other business concerns. But we aren't hiding anything either. We are open and always aim to "empower people", not "connecting people" like our friends at Nokia do here in Espoo. Artificial Intelligence has been in talks and news for a decade now, but off-late this space has picked up tremendously and has shown a rapid growth. Most of the organization from retail to fashion to education to banking and many more sector is deploying AI in every possible way to make their respective services user-friendly to customers. The simplest of an example is the replacement of human interaction to chatbots. 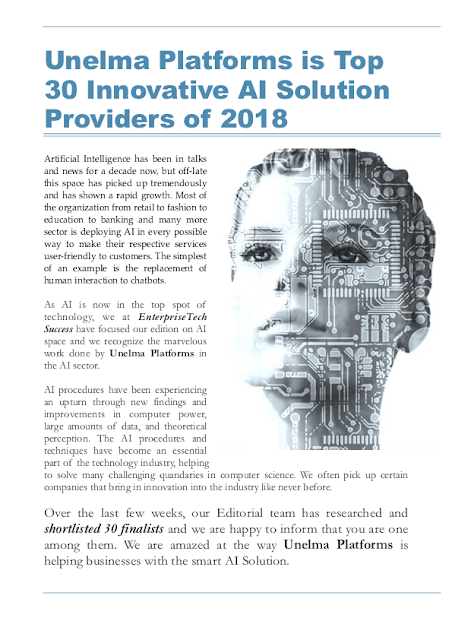 As AI is now in the top spot of technology, we at EnterpriseTech Success have focused our edition on AI space and we recognize the marvellous work done by Unelma Platforms in the AI sector. It is our pleasure to announce that today we have updated our questions and answers platform, Kuora.co with the latest changes. Our engineers, designers and developers are working extremely hard and smart to make some of the demanding changes that users of the Kuora.co platform reported. For those users who send us valuable feedback on the scrolling issue, very much thank you for that as we have fixed that bug. For those users who wanted RSS feed, we have a good news for you. We've added that feature in this update. You can also check with W3C feed validator service whether we are providing valid RSS feed or not. All the content be it questions, users and answers almost everything has own unique RSS feed link. We are also working on adding more language to Kuora.co (Nepalese language translation is soon coming to our question and answer platform). Unelma Platforms announced today to launch revolutionary digital wallet platform for an instant, secure and hassle-free online payments. e-Khalti is an e-currency, e-wallet and online payment gateway platform. A digital wallet for an instant, safe and hassle-free online payments. e-Khalti.com allows users to make online payments comfortable and convenient. It is easy for e-Khalti to transfer funds from wallet to wallet. e-Khalti is not just a digital wallet; it is an entire payment ecosystem which allows users of e-Khalti to send or receive funds from e-Khalti friends, accepting payments through major third-party payment gateways such as PayPal, advCash, Perfect Money and Payoneer. e-Khalti is unique Nepali word synonymous with a digital wallet which not only aims to digitise and build e-payment ecosystem in Nepal but also want to take it globally. RazorPay: is a payments company that provides payment solutions to online merchants in India.Omise: is a payment gateway for Southeast Asia, based in ThailandWe have also fixed category and courses deletion issue that some of our beloved users were reporting. We have now also fixed Quiz module to across different type of servers. In some case, video preview could not work and we have now fixed that issue as well. And there are several other minor bugs and fixes that we have done in our latest update to Unelma academy. During the last year, Unelma platforms announced the launch of its crowdfunding platform where the platform was slow to scale and grow. Our email marketing platform has been recently updated with latest changes. Umail.site is powerful email marketing platform that allows customers and marketers to sends bulk email at ease. We are also learning a lot with Umail.site ... we have scammers who have miused our system for their benefit and we also had good customers who would simply use the email marketing for the benefit of the mail marketing.